Established in 1965, the Assoication of Indian Forging Industry was formerly known as AIDFASI. It is the spokesman of the Indian Forging Industry, mostly for about the last four decades. For all these years, it has been headed by leaders of the industry with great vision. symposia, conferences, and reinforces this by organizing visits to International Trade Fairs, arranging Buyer-Sellers' Meets with the global players in the forging industry. It also leads trade delegations abroad to participate in International Trade Fairs organized in various countries, besides providing information on such Trade Fairs, etc. on its website well in advance, to facilitate proper planning by its members. It helps its members to mainly identify niche strategies for survival and growth in view of growing competition in the domestic and global markets through a well-developed database. Its identity as an Institution with a global presence is evident from the fact that in the year 1990, the AIFI played host to the 13th International Forging Congress and delegates from about twenty countries from all over the world attended the Congress and yet again AIFI has been given Presidentship of ASIAFORGE - a Confederation of Asian Forging Associations. It has successfully hosted the ASIAFORGE 2008 from 17-19th March 2008 in New Delhi, India. AIFI also has strong linkages with counterpart forging associations in the world e.g. in USA, Europe, Japan, China and other countries. Similarly, delegations are invited/sent abroad on a reciprocal basis. All this has helped in creating meaningful dialogue for AIFI and its members with their counterparts abroad and vice-versa by establishing new business relationships. Besides this, it is also a member of ForgeNet - a Network of Worldwide Forging Associations in order to have an effective exchange of ideas between domestic and global manufacturers. In keeping with the changes in the business environment, it redefines its role by proactive dialogue on various subjects of concern to the forging industry. AIFI has also begun gradually engaging itself in building and strengthening the database/information base of its members through dissemination of trade and other information at home and abroad on a wide scale on business opportunities, technological and other developments are in the Indian forging industry through different media like the Forging Directory, News Digest, FOCUS and an informative website, etc. To better its service to the forging industry in India and abroad, AIFI has promoted a new world class Research and Development Center along with product testing and validation facilities at Chakan near Pune. The same has been approved by the Government of India. Thus the AIFI is constantly endeavoring to look at new areas through which it will be able to continuously improve the quality of service to the members and establish a dialogue/interaction between the Indian forging industry with its counterparts abroad as also the various other user and vendor segments. As a result, the AIFI has afforded its members of the Indian Forging Industry an opportunity to gain a broader understanding about the contemporary forging technology and future developments likely in the forging industry world wide and conduct their business through informed competition. The AIFI family at present consists of about hundred and forty members, who command a large market share of about 70-75% of the total production of the Indian forging industry. This membership is growing continuously and the membership is targeted to increase by at least 30% this year. Recently taking into consideration its overall objective of more broad based service to the forging community, the other segments of industry like service providers to the forging industry, forging equipment suppliers in India and abroad, academia, consultants, etc., have been included under the AIFI umbrella as "Associate Members". It is expected that this would make AIFI membership more meaningful and interactive. To take this objective further the office bearers and the AIFI office in Pune and its office bearers travel widely to understand members' needs through regional meetings at various places all over India and initiate steps to fulfill their needs. The AIFI takes up several important issues like the Budget and Exim Policy issues on behalf of the members with the Govt. of India. AIFI member companies command, around 70% share of the Indian Forging Industry and there have been many success stories abroad too of AIFI member companies. In the new industrial scenario, the role of forging industry, as a critical feeder to a number of core industries, has been very important and AIFI is helping them play this role very effectively in this changed scenario. Quite a few of AIFI members have enjoyed a significant global presence and AIFI is constantly working towards increasing, this international presence through various forums. Its members' products include rough forgings and/or which are the machined parts like Crankshafts, Connecting Rods, Camshafts, Shifted Fork, Steering Components, Crown Propeller Shafts, Gear Box Components, Crown Wheel and Pinions, Front Axle Beams, Rear Axle Shafts, Earth Moving Link, Railway Tyres, Flanges/Pipe Fittings, Industrial Valves etc. Its members mainly cater to the automotive segment. Of late, they also cater to the non-auto user segments like aerospace, oil and exploration, etc. The equipments installed in its most member's establishment include Close Die Hammers (16T), Presses (up to16,000T), Upsetters (up to 20 cm), Open Die Presses (up to 3000 T), etc. The production range of these member companies includes Close Die (up to 600 kg), Open Die (up to 13,000 kg), Upset forgings (up to 260mm dia), ring rolling (up to 3 mtr), Disc and Tube Sheets up to (3 TSP), etc. As far as the production capabilities are concerned the member companies have the capability of producing almost all varieties of forgings like closed forgings, open forgings, Upset forgings, Warm forgings, Cold forgings, Ring rolling machining, Shell forging, Axial Close Die forgings, etc. They can forge materials like Carbon Steel, Alloy Steel, Stainless Steel, Aluminium, Super Alloy, Special Steels, Non-ferrous Metals, Titanium, etc. With this wide variety of membership for the forging manufacturers of various capabilities, the AIFI has geared itself up from time to time. It provides all the latest information through news bulletins, circulars, seminars, conferences, etc. in keeping with its role to promote and develop the Indian Forging Industry so as to meet the demands and expectations of the user industries domestically and globally. It has played a major role in encouraging proactive dialogue between the industry and Government both in terms of suggestions for policy making and problem-solving, as also between the industry and the market. Besides routine activities, the AIFI is also doing considerable developmental work to support the development and growth of the forging industry in India. To cite a few instances: the AIFI is actively involved in new and upcoming areas like technology upgradation and cutting costs through energy conservation by collaborating with Government institutions like PCRA and other developmental institutions. This is done with a view to improve the overall operational efficiency of its members and cutting costs.The AIFI has engaged itself in the developmental initiatives such as a regular interaction with Suppliers of Raw Materials (Steel Producers mainly), User industries (Automobile Industry primarily) and Educational Institutions in the field of forging technology like NIFFT, etc. The main aim behind the latter is the upgradation of the quality of studies in the field of forge technology, as well as initiation of R&D facilities for the forging industry in India as also with its counterparts in other parts of the world. Towards this end and as a part of its effort at establishing international cooperation, the AIFI has promoted a world class R & D, Product Testing and Validation Centre at Pune. The technology gap is also being sought to be bridged so that companies are prepared to face challenges of global markets. It has also introduced usually new membership called "Associate Membership" to help establish a meaningful dialogue between the forging industry, the service providers, equipment suppliers and others interested in the forging industry. Efforts of AIFI are on to attract more manufacturing units to venture into exports. This is being done through increased facilitation by way of organizing Training Sessions, Workshops, participations in Trade Fairs, Exhibition, Buyer-Seller Meets, hosting international forging events, etc. The AIFI is also making concerted at showcasing the capabilities of the Indian Forging industry to the world, by hosting a number of international events . 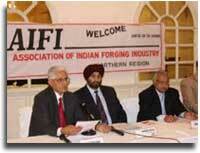 The role of AIFI is to promote and develop the Indian Forging Industry so as to meet the demands and expectations of forging customers and end users, both domestic and global by improving the business environment for its members and contribute in increasing their competitiveness through mutual co-operation and understanding of all parties concerned and constant updating of information and technology. The AIFI is actively involved in trade promotion, technology upgradation, collection and dissemination of information. A sound academic system, solid industrial infrastructure and salubrious climate apart from the rich social milieu and a comfortable pace of life has made Pune the preferred destination for several established and new business houses including multinational corporations dedicated software companies, training and research institutes, etc. AIFI is housed in NYATI MILLENNIUM situated at Viman Nagar, just off the Pune-Ahmednagar highway.The complex is approximately 2 kms.from the airport, 7 kms from the Pune main railway station, and just 15 minutes away from the main business centers of Pune City. Most of the major forging shops are located within 10 kms radius of the AIFI headquarters.